On 9th March 2018 H.E. 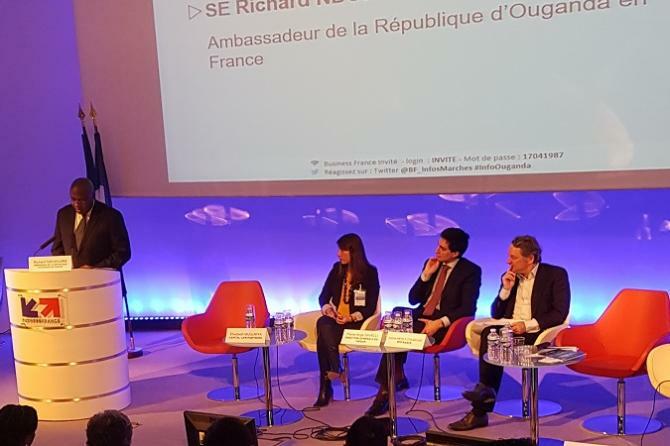 Richard Nduhuura, Uganda's Ambassador to France also accredited to Spain, Portugal, and Permanent Delegate to UNESCO, OECD and BIE addressed the French business forum organized by Business France Paris 9th March 2018. Business France is an Agency responsible for the international development of French companies, international investments in France and the economic promotion of France. Their priority: simplify and accelerate the realization of their projects. The agency also facilitates and supports the decision - making of foreign investors throughout the business project by mobilizing its advisors and its network of partners in the region. This Forum was co-organized by Business France jointly with the Agence Francaise de Developpement (AFD) (a public agency that is central to French cooperation and working to combat poverty and foster the development of countries of the South), Stanbic Bank Uganda and the French Embassy in Uganda. Ugandan side was led by Mr. Paul Muganwa, Head Investment Banking. Madame Stephanie Rivoal, French Ambassador to Uganda was also present to give impetus to the French business community to select Uganda as the ultimate investment destination. The Purpose of the Forum was to provide a platform for sharing information with French Companies seeking to know the business and industrial opportunities Uganda offers: H.E. Richard Nduhuura, was invited to close the Symposium. H.E. Richard Nduhuura, told his audience that together with Amb. Stephanie Rivoal they have developed a strong partnership to strengthen relations between Uganda and for the mutual benefit of both their peoples. He informed them that since 2016, two big Investment and trade delegations from France have visited Uganda with resounding success and he looked look forward to even better results. He observed that the future belongs to those who are willing to work hard and was no longer about where you are from, but rather how big you dream, and what you can do. He remarked "Uganda is very happy to see our friends in France making a very big contribution to Uganda's development" and added that currently Total is the leading investor not only in Uganda's oil and gas sector but also overall in terms of Capital investments. He highlighted Uganda's national priorities being given utmost emphasis for investment and said they included but are not limited to: agriculture and agribusiness, information communication technology (ICT), tourism, packaging, tourism and pharmaceuticals and invited the French Companies to come and invest in Uganda.